Germund Paaer and many more. Famous Finnish Jewelry designed with old historical epic Kalevala in mind. Koru means Jewel in Finnish. Made mostly of Gold, Silver and Bronze. 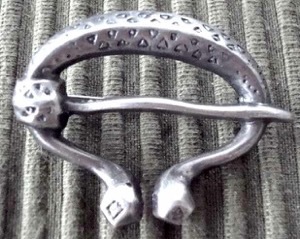 Pewter is not common but appear to exist - maybe because of metal shortages in the 1940-ties. 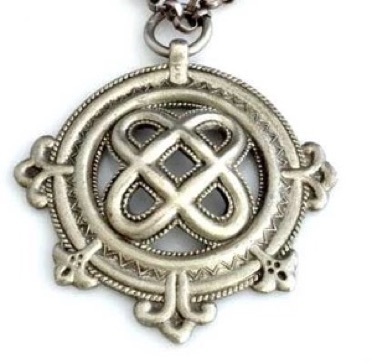 There is an amount of uncertainty about the Kalevala Koru pewter jewelry but if it is Gold or Silver it is likely to be hallmarked accordingly. 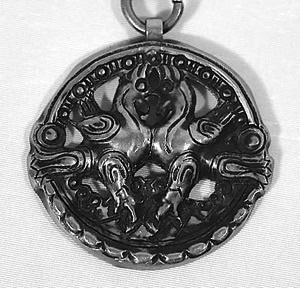 If it is Bronze or Pewter it can be more difficult to tell apart. In any case genuine Kalevala Koru is very popular and sought after. The story behind Kalevala Koru is most interesting and can be found on the internet.